Virtually every type of window covering can be motorized. Whether you are considering shades, blinds, drapes or shutters, we can automate them all! Motorized window coverings are more affordable than you may think. They can be scheduled to move according to the sun’s position which maximizes energy efficiency and saves you money on heating and cooling bills. Automated window coverings are convenient to operate with the push of a button, a swipe of a screen on a mobile device, or voice activation. Why not schedule your window coverings to move themselves, saving you time and adding to the security of your home while you are away. 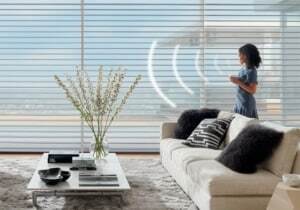 Motorization is becoming a very popular option, especially for operating hard to reach windows coverings, skylight shades, blinds behind a tub or couch, or to easily control several windows coverings all at once. Another benefit to motorized window coverings is the clean and tidy look they provide as there is no need for lift cords or chains making them aesthetically pleasing. Eliminating the cords makes automated shades an ideal choice for homes with children and pets. To protect your furnishings from the sun’s damaging ultraviolet ray’s window treatments can be programmed, or sun sensors added to close when the sun harmful rays come into your home or business. A simple battery system added to most blinds or shades can be an affordable option to consider. Whether you’re looking for an inexpensive motorized shade or a whole home integrated solution, Ruffell & Brown can help you make the right choices for you and your budget. We carry several manufactures to ensure a selection in every price range and every available option is available to you. Our experienced certified trained professional sales team have suppled and installed automated window coverings since 1987, this ensures that you are dealing with experts and leaders in the window covering industry.